Murphy Road Baptist Church was established at its current location in 1979. In 2004, the current sanctuary and education building were built. In the last two years, different areas of the church have undergone debt-free remodeling. Within the last two years updates such as new carpet, tiles and paint were made in the children’s and preschool departments. In the summer of 2018, the parking lot, which was original to the 1979 building, was redone complete with a fire loop. Additionally, in 2018, the sanctuary was remodeled. 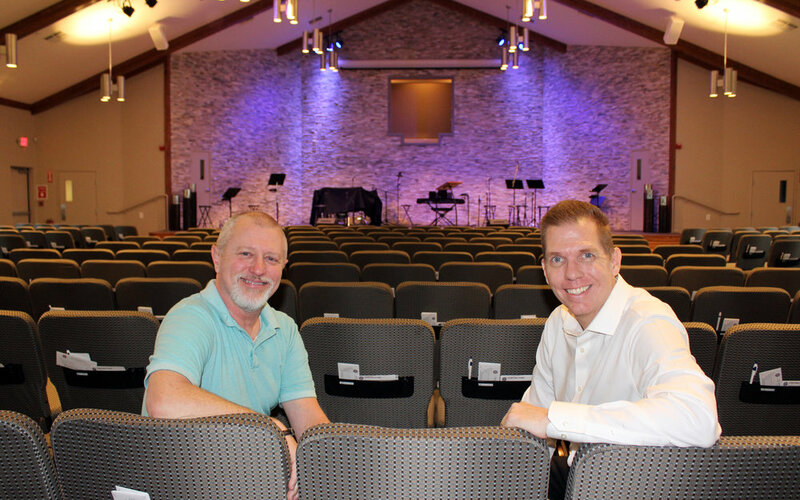 John Fletcher, MRBC Student and Media Minister and Lash Banks, MRBC Lead Pastor in the recently remodeled sanctuary. John Fletcher, MRBC Student and Media Minister explained why the sanctuary remodel was necessary, “It needed to be updated and we needed to remove existing walls to make more space.” They relocated an office and conference room which were in the back portion of the sanctuary, giving them an increase of approximately 90 seats. Contemporary, yet timeless, stacked stone accent walls were added to both the front and back of the sanctuary. The stage was reworked which improved accessibility and useable space. They added lights, redesigned their sound system, added new chairs and new carpet. All of these changes create a brighter, fresher atmosphere. They also added a vestibule which helps control sound from the foyer. During the 3.5 month long remodel, worship service was held in the student building and they increased their amount of Sunday morning services from two to three. Congregation members have stated that they are very pleased with the new aesthetics. The renovation will also appeal to prospective wedding parties since the sanctuary has more space and is a brighter venue than before. In 1979, MRBC averaged approximately 75 in weekly attendance. Currently, they have between 400 and 500 people in attendance. These numbers include the Spanish congregation and the Asian/Indian congregation which both meet at different times on Sunday afternoon in the student building. MRBC also has a Vietnamese congregation church plant which meets in Garland and three churches, “Solid Rock India” which meets in Punjab, India.